Jon, the Curator at Burghley House, has a job akin to that of a detective. Researches in Burghley’s vast archives and collections have led to fascinating discoveries. The maker of the 18th century entrance gates to the North forecourt was unknown until conservators carrying out restoration work spotted similarities with designs of other late 17th century/early 18th century prestige ironwork, notably that at Hampton Court Palace. These gates were constructed in a new way with a floral and artistic rather than purely practical design. The craftsman was thought to be the French Huguenot Jean Tijou, who worked on many important English Baroque buildings. 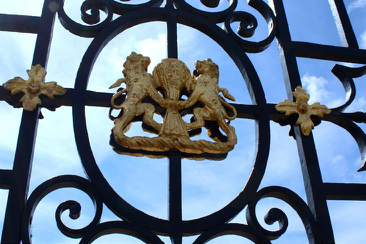 Jon knew from Burghley’s archives that Tijou had created the house’s fabulous ‘Golden Gates’ but had no previous evidence of Tijou’s hand in the forecourt gates. Research also showed that ironwork prior to the mid-19th century was never black but often a bright colour to show off complicated and expensive designs. Front of House Manager for John Clare’s cottage, David Dykes, narrated the life of the ‘peasant poet’ John Clare, who was born in Helpston in 1793. Clare, the son of a labourer, fitted into neither his own social circle nor the London literary scene. Determined to read, unlike his friends, he penned his first poem, “The Moving Walk”, aged 13. A solitary man, Clare was inspired by the countryside, always at one with nature, keeping records of local music played to him and of local customs. An erudite man, he collected a large library. A strong influence upon him was the 1809 Enclosure Act which he bitterly opposed. As well as labouring, Clare attempted a series of jobs locally including joining the local militia in Oundle and working as a lime burner at Casterton to support his parents. He was not successful commercially despite attempts to have his work published by public subscription and in later life he suffered from depression, being committed to the asylum in Northampton. 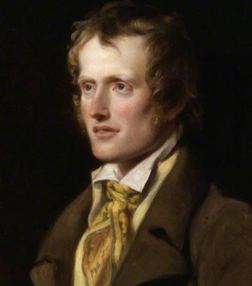 John Clare died in 1864 and “A Poet is Born not Made” is inscribed upon his tomb. Lionel began his most informative talk by comparing Roman church basilica designs c.430 AD, as found at Silchester, with Anglo Saxon hall churches such as at Escomb and he noted that by 664 AD the Synod of Whitby had adopted Romanesque architecture. The Norman period witnessed an explosion of decoration with stone vaulting and chevron moulding but lack of glass necessitated small windows. 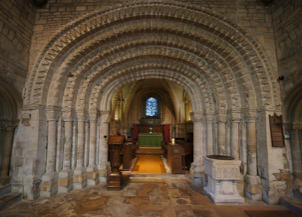 In Lionel’s opinion the finest Norman chancel arch in England, with beak head decoration, can be found at Tickencote (pictured). Fascinatingly, Wakerley Church’s chancel arch is decorated with Norman soldiers engaged in battle. English Gothic churches enjoyed superior stone cutting techniques and this period’s greater understanding of structural engineering facilitated higher towers. The High Gothic period encompassed the decorated and the perpendicular styles. The 15th century welcomed the leaded roof with gargoyles. There was also a greater focus on light with larger windows, and carving had evolved to become ‘shop work’ rather than being fashioned in situ. During the Reformation churches were defaced and chantry chapels abolished and churches steadily decayed until the Victorian era as the rich stopped supporting churches. Find out more about the churches worth visiting from Lionel’s website. Why are so many architects and their clients still in love with massive glass-constructed buildings, which demand huge amounts of energy to reduce heat within the structure? Are there more sustainable designs resilient to changing climate patterns that use less energy? Alan Short, The Professor of Architecture, University of Cambridge, gave a fascinating talk on how environmental design strategies can respond efficiently to a changing climate. environment for health, comfort, and low energy use. In the 1920s, Mies van der Rohe, one of the pioneers of modern architecture, designed the first glass skyscraper which proclaimed progress and commercial success. Alan leads a series of large projects which aim (and succeed!) in moderating the internal environment through natural or mechanical means, with different strategies for different environmental patterns. 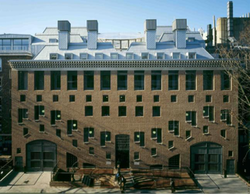 Just one example, the School of Slavonic and East European Studies in Bloomsbury (picture by Peter Cook), is naturally lit, naturally ventilated and passively cooled by air flows. It has won many awards for its beauty and functionality. As the climate changes, these solutions become of fundamental importance. 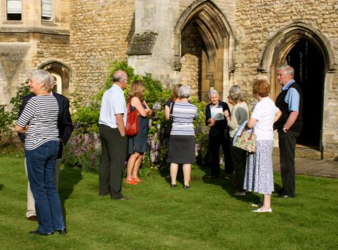 Society members were blessed with a glorious June evening for their guided tour of William Browne’s Hospital. After a warm welcome from Pam Sharp, the Rev. David Bond presented an overview of William Browne and the Hospital’s history which began in 1475 and was founded over a number of years. As a Merchant of The Staple (wool), Browne, a wealthy local landowner, built the Hospital to house ten ‘old men’ and two ‘old women’. These residents were expected to pray for Browne and his family in the Hospital’s chapel. The Common Room was originally divided into ten cubicles and those too infirm to enter the chapel retained a clear view of it from their beds. The women were housed in an area behind the chapel. As well as members being able to view the cloister garden in full June bloom, they were also able to examine three of the Charters granted to the Hospital by Richard III, Henry VII, and James I respectively. A major highlight was the chapel with its altar, at one time buried beneath the chapel floor, the medieval stained glass and the carved misericords. A group of 25 members enjoyed a conducted tour of Apethorpe Palace, one of England’s greatest country houses and the last surviving Jacobean royal residence. It is now privately owned and English Heritage provided two very knowledgeable tour guides who, over a two hour period, explained the architecture and history of the building to the fascination of all. 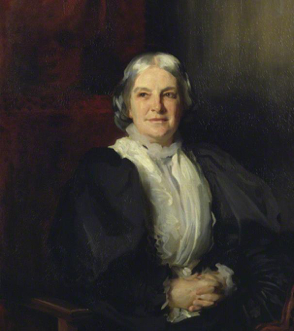 For such an influential person, who wanted to build a socially inclusive society with access to good housing, arts and beauty for all, Octavia Hill (18381912) is not as widely known as she should be. The Grade II* Birthplace House on Wisbech’s South Brink, does an excellent job in explaining her ideas and ideals and their relevance in today’s society. She is primarily remembered as a founder of the National Trust, but her pioneering work also helped to develop modern concepts in social work, and led to the creation of housing associations, civic societies, the Army Cadet movement and London’s Green Belt. An indomitable campaigner, she built networks of donors and volunteers that could take forward her ideas. Octavia believed that although people needed good living conditions, if deprived of beauty their lives would be diminished. She trained with John Ruskin as an art copyist and with her sister founded the Kyrle Society ‘for the diffusion of beauty’. She had a strong belief that everyone had a responsibility for an inclusive society and to the end remained sceptical of ​those who placed their hopes in central and local authority attempts to solve society’s problems.